Readings: Heb 12:1-4; Mk 5:21-43. 1/ Reading I: NAB Hebrews 12:1 Therefore, since we are surrounded by so great a cloud of witnesses, let us rid ourselves of every burden and sin that clings to us and persevere in running the race that lies before us 2 while keeping our eyes fixed on Jesus, the leader and perfecter of faith. For the sake of the joy that lay before him he endured the cross, despising its shame, and has taken his seat at the right of the throne of God. 3 Consider how he endured such opposition from sinners, in order that you may not grow weary and lose heart. 4 In your struggle against sin you have not yet resisted to the point of shedding blood. 2/ Gospel: NAB Mark 5:21 When Jesus had crossed again (in the boat) to the other side, a large crowd gathered around him, and he stayed close to the sea. 22 One of the synagogue officials, named Jairus, came forward. Seeing him he fell at his feet 23 and pleaded earnestly with him, saying, "My daughter is at the point of death. Please, come lay your hands on her that she may get well and live." 24 He went off with him, and a large crowd followed him and pressed upon him. 25 There was a woman afflicted with hemorrhages for twelve years. 26 She had suffered greatly at the hands of many doctors and had spent all that she had. Yet she was not helped but only grew worse. 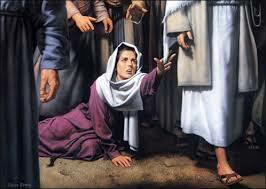 27 She had heard about Jesus and came up behind him in the crowd and touched his cloak. 28 She said, "If I but touch his clothes, I shall be cured." 29 Immediately her flow of blood dried up. She felt in her body that she was healed of her affliction. 30 Jesus, aware at once that power had gone out from him, turned around in the crowd and asked, "Who has touched my clothes?" 31 But his disciples said to him, "You see how the crowd is pressing upon you, and yet you ask, 'Who touched me?'" 32 And he looked around to see who had done it. 33 The woman, realizing what had happened to her, approached in fear and trembling. She fell down before Jesus and told him the whole truth. 34 He said to her, "Daughter, your faith has saved you. Go in peace and be cured of your affliction." 35 While he was still speaking, people from the synagogue official's house arrived and said, "Your daughter has died; why trouble the teacher any longer?" 36 Disregarding the message that was reported, Jesus said to the synagogue official, "Do not be afraid; just have faith." 37 He did not allow anyone to accompany him inside except Peter, James, and John, the brother of James. 38 When they arrived at the house of the synagogue official, he caught sight of a commotion, people weeping and wailing loudly. 39 So he went in and said to them, "Why this commotion and weeping? The child is not dead but asleep." 40 And they ridiculed him. Then he put them all out. He took along the child's father and mother and those who were with him and entered the room where the child was. 41 He took the child by the hand and said to her, "Talitha koum," which means, "Little girl, I say to you, arise!" 42 The girl, a child of twelve, arose immediately and walked around. (At that) they were utterly astounded. 43 He gave strict orders that no one should know this and said that she should be given something to eat. People are very realistic, they only do what benefit them and refuse to do what are useless. Similarly in the area of faith, people question: what does faith bring benefits for them? Today readings help people to recognize the benefits of faith. In the first reading, the author of the Letter to the Hebrews compared human life as a running race in a stadium. In order to reach the goal, people need to discard all the weights which are sins; to patiently finish their race; and especially, to imitate Christ who is the leader and the perfecter of faith. In the Gospel, St. Mark reported two miracles which were happened due to the patients’ faith. Firstly, a woman who endured hemorrhages for twelve years, was healed because she thought that she only needs to touch the fringe of Jesus’ cloak. Secondly, the daughter of the head of a synagogue, Jairus, was healed because the father had a strong faith in Jesus. 1/ Reading I: Let run to reach the goal. (1) To eliminate all unnesessary things and sins which are chaining them: To run a long race, like marathon, a runner needs to discard all unnecessary things, because a weight, no matter how small it is, shall become a burden for him in a long run. Similarly in the race of faith, a believer needs to terminate all bad habits, because a sin, no matter how small it is, shall cause trouble for him to finish his race. (2) To patiently run the race: Unlike a running race in a stadium which only has a few rewards for some people, all the faithful who finish the race of faith shall have their reward. Therefore, the important element in the race of faith doesn’t depend on fastness, but on the perseverance to finish the race. 1.2/ We should always imitate Jesus, the leader and the perfecter of faith: When people fight, they fight for a purpose. Because of the ultimate goal, people can overcome all trials and sufferings of their life. The faithful should imitate Jesus who was incarnated and suffered to furfill God’s will. In other words, because his joy of bringing salvation for humankind, he “endured the cross, despising its shame, and has taken his seat at the right of the throne of God.” The faithful must do the same, because of the hope of salvation which Jesus suffered to bring it, we are ready to overcome all sufferings of our life as Jesus did. 2/ Gospel: "Daughter, your faith has made you well; go in peace, and be healed of your disease." 2.1/ The ruler of a synagogue asked Jesus to come to his house and to heal his daughter: The title, “the ruler of a synagogue,” told his authority and honor. Through many conflicts between Jesus and the Jews, he can be the person that avoids or has confliction with Jesus. In opposition, according to today’s report, he fell at his feet,and besought him, saying, "My little daughter is at the point of death. Come and lay your hands on her, so that she may be made well, and live. "When Jesus saw his sincere expression of faith, he agreed to go to his house, and a great crowd followed him. 2.2/ Faith can heal a terminate disease: When Jesus was on his way to Jairus’ house, another miracle was happened. “There was a woman who had had a flow of blood for twelve years,and who had suffered much under many physicians, and had spent all that she had, and was no better but rather grew worse.She had heard the reports about Jesus, and came up behind him in the crowd and touched his garment.For she said, "If I touch even his garments, I shall be made well. "”She did so, and immediately her hemorrhage ceased; and she felt in her body that she was healed of her disease. There were only two persons who knew what have happened are Jesus and the woman. Jesus’ disciples couldn’t understand why Jesus said “Who touched me?” They said to him, "You see the crowd pressing around you, and yet you say that?" Jesus knew what he was doing, and he looked around to see who had done it. At that moment, the woman, knowing what had been done to her, came in fear and trembling and fell down before him, and told him the whole truth.Jesus said to her, "Daughter, your faith has made you well; go in peace, and be healed of your disease." 2.3/ Faith helped Jairus daughter to live again: While Jesus was still speaking, there came from the ruler's house some who said, "Your daughter is dead. Why trouble the Teacher any further?" Ignoring what they said, Jesus said to the ruler of the synagogue, "Do not fear, only believe." There are at least three times in the Gospel, the evangelists reported Jesus resurrected the death: in today report; the son of the widow in Nain (Lk 7:11), and Lazarus (Jn 11). People who witnessed these miracles were in great amazement; because they never saw anything like them before. In Lazarus’ resurrection, Jesus emphasized the necessary of faith to Martha: “I am the resurrection and the life; he who believes in me, though he die, yet shall he live, and whoever lives and believes in me shall never die” (Jn 11:25-26). - Faith is necessary for us to be loyal with God until the end. Without faith, we are easy falling down before all trials and sufferings of our life. - Faith can help people to overcome some dangerous diseases which can’t be explained by medical doctors. - Faith empowers us to live. If we believe in God, death can’t dominate us. Once we pass over the physical death, we shall happily live with God forever.